This is an all original and EXTREMELY clean 1959 Tudor Tuxedo (same model we supplied to Roger Sterling on Mad Men) for the last 3 seasons. This 34mm. stainless steel case with ROLEX oyster winding crown has the inwardly curved (bombe) lugs and ROLEX OYSTER screw back. 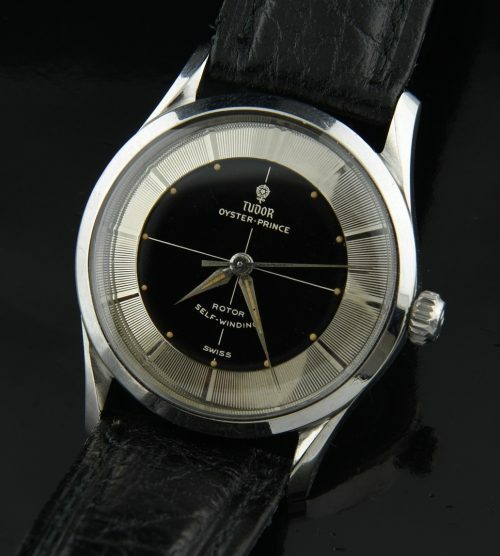 The two-tone “TUXEDO” style (name we coined) dial with original steel Dauphine hands looks fabulous. The automatic winding TUDOR movement was recently cleaned and is accurate. This original bulls-eye dial is amazing. Look at the vanilla lume! The hands have some usual ageing, but original lume. These Tudor Tuxedos are becoming very hard to find these days. This example is a gem-truly one of the best we’ve ever offered-wait until you see it in person.